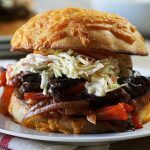 This Portobello Mushroom Sandwich is the BEST! Big, rich and meaty this vegetarian burger will make you a believer of a meatless meal! It can be made in the slow cooker or Instant Pot and it's super easy. Clean the portobello mushrooms, remove the stem & fins, place in the slow cooker. Top with the pre-sliced mushrooms. Slice the bell pepper, remove the seeds and slice into strips. Remove the outer peel from the onion and slice into strips. Place into the slow cooker with the mushrooms. Season the vegetables with salt, pepper & red pepper flakes, top with bbq sauce. Put the lid on the slow cooker & cook on high for 4 hours or low for 6. While the meal is cooking, make the cole slow. Thinly slice the cabbage, clean & shred the carrots (I use a box grater. ), thinly slice the onions, place in a large bowl. Mix the coleslaw dressing together - it will be quite thick, but that's how you want it. Mix the dressing with the vegetables, refrigerate until ready to use.